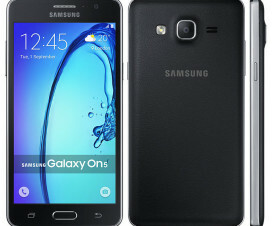 Samsung introduced the A series smartphones last year which includes Galaxy A3, Galaxy A5 and Galaxy A7 in the lineup. Now Samsung is all planning to introduce the new Android smartphone in the A series which will be biggest of all according to the latest leak. The rumored specs and features of Samsung Galaxy A8 based on the leak are mentioned below. As per the leak, the Samsung Galaxy A8 will be launched as model number SM-A800F and sports a 5.7-inch Full HD Super AOMLED display bigger to those of other A series smartphones. The multitasking will be smoother with the presence of 2GB RAM and is powered with Qualcomm Snapdragon 615 64-bit Octa-Core processor. It is said that the device packs 16MP rear camera and 5MP front facing camera and also includes 16GB of internal storage. There are no details available regarding the secondary storage of the smartphone. Apart from normal connectivity, the device also adds LTE support and runs on Android 5.0.1 Lollipop OS. A 3,050 mAh battery will be powering the Samsung Galaxy A8 smartphone. According to the leak, the device measures 5.9mm in terms of thickness and has weight of 140 grams. There are no details available to the official launch of Samsung Galaxy A8 Android Smartphone. But the device will be first available to Chinese market and thereafter may available to Global market. Stay connected as will be updated with latest Samsung Galaxy A8 launch details and other tech news and updates.